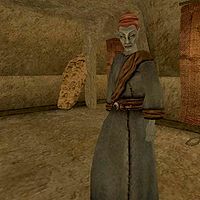 Eldrilu Dalen is a Dunmer priestess who works at the Vos Chapel in Vos. There she sells books (just religious texts), ingredients, potions, spells, and spellmaking services to all who need them. She is a restocking vendor of the following ingredients: Ash Salts, Ash Yam, Corkbulb Root, Fire Salts, Guar Hide, Netch Leather, Saltrice, Scrib Jelly, and Scrib Jerky.